On December 21, 2017, the U.S. District Court for the Central District of California released its long-awaited Memorandum of Findings of Fact and Conclusions of Law in TCL Communications v. Ericsson (SACV 14-341 JVS(DFMx) and CV 15-2370 JVS (DFMx)). In a lengthy and carefully crafted decision, Judge James Selna sets forth some important new points regarding the calculation of fair, reasonable and non-discriminatory (FRAND) royalties for standards-essential patents (SEPs). Among other things, the decision offers a strong endorsement of “top down” methodologies for the calculation of SEP royalties, and makes significant use of the non-discrimination (ND) prong of the FRAND commitment in arriving at a FRAND royalty rate. Equally importantly, the case establishes that, for non-discrimination purposes, even low end vendors like TCL will be considered “similarly situated” to high end vendors like Apple, giving them the benefit of the rates that high end vendors can negotiate with SEP holders for far more expensive consumer products. The case involves the sale of cellular handsets by TCL, a Chinese firm reported to be the seventh largest global manufacturer of mobile phones. Ericsson is one of the largest holders of patents essential to the implementation of the 2G, 3G and 4G wireless telecommunications standards published by the European Telecommunications Standards Institute (ETSI) (standards-essential patents or SEPs). Under ETSI’s policies, ETSI participants are required to grant licenses under their SEPs to implementers of ETSI standards on terms that are fair, reasonable and non-discriminatory (FRAND). In 2007, TCL obtained a 7-year license under Ericsson’s patents covering ETSI’s 2G standards. In 2011, the parties began to negotiate a license under Ericsson’s 3G SEPs, and in 2013, these negotiations expanded to include Ericsson’s 4G SEPs. Over the next several years, the parties were unable to reach agreement on the terms of this license, and during the course of negotiations, Ericsson sued TCL for infringement of its SEPs in six non-U.S. jurisdictions. In March 2014, prior to the expiration of TCL’s 2G license, TCL filed an action in the Central District of California seeking a judicial declaration that Ericsson breached its obligation to offer TCL a license on FRAND terms. TCL agreed to abide by the court’s determination of FRAND terms for a worldwide license under Ericsson’s 2G, 3G and 4G SEPs (slip op. at p.9). Partially based on this assurance, in June 2015 the court entered an “anti-suit injunction” against Ericsson, prohibiting it from pursuing further infringement litigation against TCL until the resolution of the FRAND issues (I discuss TCL’s anti-suit injunction here). The court ruled that the nature of TCL’s claims was equitable (p.8), making it suitable for judicial (rather than jury) determination, and a 10-day bench trial was held in early 2017. The court’s decision was rendered in November 2017, and a public version was released in December 2017 in which certain competitive information was redacted. Numerous U.S. cases have made clear that a FRAND royalty must be “premised on the value of the patented feature, not any value added by the standard’s adoption of the patented technology … [so that] the royalty award is based on the incremental value that the patented invention adds to the product, not any value added by the standardization of that technology” (p. 108, quoting Ericsson v. D-Link, 773 F.3d at 1232-33 (Fed. Cir. 2014)). Unlike the recent UK decision in Unwired Planet v. Huawei ( EWHC 711 (Pat), 5 Apr. 2017] (which I discuss here and here), which held that there is but a single FRAND rate applicable to any given set of parties and SEPs ((¶804(4)), Judge Selna in TCL v. Ericsson holds that there is no single FRAND rate (p. 109). There are two general schools of thought regarding the calculation of SEP royalties subject to FRAND commitments: bottom-up and top-down. “Bottom-up” approaches attempt to assess the value of asserted SEPs in isolation, using comparable license agreements and other methodologies, but without significant reference to other patents covering the same standard (I critique bottom-up methodologies here and here). In contrast, top-down approaches first determine the aggregate royalty that should be paid for all SEPs covering a particular standard, and then allocate an appropriate portion of the total to the asserted SEPs (I discuss top-down royalty calculations at length here, as do Norman Siebrasse and Tom Cotter in this recent chapter). Top-down approaches were used by the UK court in in Unwired Planet and by the Japanese IP High Court in Apple Japan v. Samsung (2014) (both discussed here). And in November 2017, the European Commission emphasized in its Communication on SEPs that “an individual SEP cannot be considered in isolation. Parties need to take into account a reasonable aggregate rate for the standard, assessing the overall added value of the technology” (p. 7). However, with the exception of In re. Innovatio IP Ventures (N.D. Ill. 2013), most U.S. courts making FRAND royalty determinations have used bottom-up methodologies heavily dependent on an analysis of comparable licenses (e.g., Microsoft v. Motorola (9th Cir. 2014), Ericsson v. D-Link (Fed. Cir. 2014)). In TCL v. Ericsson, Judge Selna largely adopts the top-down methodology proposed by TCL (see below). He notes that the “appeal of a top down approach is that it prevents royalty stacking”, which occurs when individual SEP holders each demand a royalty that, when combined, can be excessive (p.15). However, the court also notes that top-down methods cannot assess whether the licensor complied with the non-discrimination prong of the FRAND commitment. Accordingly, Judge Selna undertakes a separate non-discrimination analysis based principally on the review of comparable licenses (discussed below). He then combines the top-down and comparables approaches to determine the appropriate FRAND royalty rate. A top-down royalty calculation methodology has two steps: determining the aggregate SEP royalty applicable to a standard, then allocating an appropriate portion of the total to the asserted SEPs. As I have discussed before, the UK and Japanese courts that applied top-down methodologies in FRAND cases based their aggregate rates on public statements made by SEP holders and other market participants. Judge Selna also adopts this approach, citing various public statements and press releases by Ericsson that support an aggregate royalty of 5% on the 2G and 3G standards and a rate between 6% and 10% on the 4G standard (pp.19-26). While the court acknowledges that this method “is not perfect” (p.25), one of its merits is its dependence on statements made by Ericsson itself to induce the market to adopt standards covered by its own SEPs (p.25) (for a discussion of “market reliance” on FRAND commitments, see this paper). Once an aggregate royalty rate for all SEPs covering a standard has been determined, the appropriate portion must be allocated to the SEPs asserted in the case. In TCL v. Ericsson, this determination involved two contentious steps: determining the total number of SEPs covering each standard (the denominator), then determining Ericsson’s share of those SEPs (the numerator). The percentage of SEPs held by the SEP holder is the quotient of the numerator divided by the denominator. Essentiality. It is well known in the literature that many patents declared by their owners as “essential” to a particular standard are, upon closer inspection, not really essential at all (up to 80% in some cases). This is the problem of “over-declaration”, and it occurs because there is no verification by any third party of the essentiality of patents declared by their owners to be SEPs. As a result, courts considering total royalties attributable to SEPs covering a standard must also consider how many patents are actually essential to the standard. Optional Portions. An initial question addressed by the court is whether patents covering optional portions of a standard should be considered “essential” to the standard. After analyzing the specific language of the ETSI policy, the court concludes that patents covering optional portions of an ETSI standard should not count as SEPs (p.27). Essentiality Sampling. Instead of analyzing the essentiality of each patent declared essential to the 2G, 3G and 4G standards, TCL’s experts sampled one-third of the patents covering each standard for each of the fifteen largest patent holders. Thus, of 7,106 declared patent families covering user equipment, TCL analyzed the essentiality of approximately 2,600 patent families. After various forms of cross-checking, it determined that a total of 413 patent families were essential to the 2G standard, 1,076 to 3G and 1,673 to 4G (pp.28-29). Interestingly, it appears that TCL’s experts charged approximately $100 per patent for this analysis (p.30), which is significantly lower than the $10,000 per patent that is generally acknowledged as the cost of essentiality analyses for patent pools (some figures are collected here). One of the reasons for the low cost of TCL’s analysis was that TCL’s experts reviewed only the claims of the examined patents, not the full specifications. Given that a review of patent specifications could have resulted in additional patents being found non-essential (p.31), the court adjusts the totals downward to arrive at 365 SEPs covering 2G, 953 covering 3G and 1,481 covering 4G (p.32). Ericsson’s Share. To compute Ericsson’s share of SEPs covering the relevant standards (the numerator), the parties’ experts determined which of the SEPs already identified would be owned by Ericsson during the term of a 5-year (60-month) license (p. 37). Under the holding of Brulotte v. Thys, 379 U.S. 29 (1964), which prohibits post-expiration patent royalties, the court eliminates from Ericsson’s total any patents that expired prior to the date of closing arguments (May 18, 2017) (p.36). Interestingly, the court did not require the elimination of expired SEPs from the total number of SEPs (the denominator). It explained that “[b]ecause the total aggregate royalty represents the value of all expired and unexpired inventions in the standard, … removing an expired SEP from the denominator treats the invention as no longer having value. The invention however still has value, that value has merely been transferred to the public domain. To remove expired patents from the denominator (without decreasing the total aggregate royalty) would result in transferring the value from expired inventions to the remaining patents in the standard instead of the public.” (p.36). Interestingly, while the parties agreed that Ericsson held 12 2G SEPs, they disagreed with respect to the number of 3G and 4G SEPs SEPs held by Ericsson (TCL finding 19.65 3G SEPs and 69.88 4G SEPs, and Ericsson finding 24.65 3G SEPs and 111.51 4G SEPs) (p. 37). In any event, even using Ericsson’s estimate of approximately 150 SEPs, this is a relatively modest share of the 3,162 patent families essential to the 2G, 3G and 4G standards. Relative Strength. TCL argued that Ericsson’s proportionate share should be adjusted based on the relative importance of Ericsson’s SEPs compared to other SEPs covering the standards at issue (pp. 38-40) (this concept was introduced by Judge Robart in Microsoft v. Motorola, in which the court evaluated both the importance of the asserted patents to the standard and the importance of the standard to the overall product). Though Judge Selna did not accept TCL’s methodology for gauging the importance of Ericsson’s SEPs, it did concede that “Ericsson’s patent portfolio is certainly not as strong or essential as it has claimed” (p. 43). The court recognized that Ericsson’s patent strength was greatest in the U.S. and therefor determined that a discount rate should be applied to Ericsson’s FRAND royalty outside of the U.S. It reasoned that “a global patent rate that does not account for differences in national patent strength provides the SEP owner a royalty based on features that are unpatented in many jurisdictions” (p. 44). 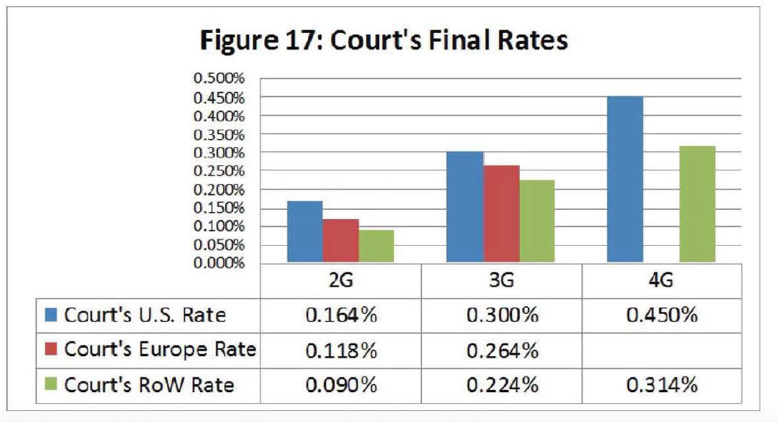 For the sake of simplicity, the court divided the world into three regions: U.S., Europe and Rest of World (ROW) and established precise discounts for non-U.S. regions for each standard (e.g., for ROW, Ericsson’s 2G value share is 54.9% of the U.S. value) (p. 45). This approach is significantly more fine-grained than that taken by the UK court in Unwired Planet, which divided the world into just two categories: Major Markets (U.S., Japan, Korea, India and several European countries) and all other countries, including China. The FRAND rate for non-Major Market countries was simply 50% of the Major Market rate. Even though the court does not accept each of TCL’s methodological steps in its top-down royalty analysis, the court finds, on the basis of those portions of the analysis that it accepts, that Ericsson’s offers to TCL are not “fair and reasonable” under its ETSI FRAND commitment. The court next analyzes whether Ericsson’s offers to TCL complied with the non-discrimination prong of its FRAND commitment. Similarly Situated. As noted above, a FRAND license must be non-discriminatory. This means that the licensor must not discriminate against similarly-situated licensees (p. 54). In TCL v. Ericsson, the court undertakes the most detailed analysis to-date to identify which firms are similarly situated with the potential licensee. First, it concludes that the basis for comparison must be “all firms reasonably well-established in the world market” [for telecommunications products] (p. 56). The court expressly excludes from this group “local kings” – firms that sell most of their products in a single country (e.g., India’s Karbonn and China’s Coolpad) (p. 59). The firms that the court finds to be similarly situated to TCL are Apple, Samsung, Huawei, LG, HTC and ZTE (p. 58). Ericsson argued that Apple and Samsung are not similar to TCL given their greater market shares and brand recognition, but the court rejects that argument, reasoning that “the prohibition on discrimination would mean very little if the largest, most profitable firms could always be a category unto themselves simply because they were the largest and most profitable firms” (p. 61). The court found Ericsson’s licenses to Apple and Huawei to be suitable benchmarks for comparison to its offers to TCL (p. 91). This conclusion is critical, because it establishes that low end vendors like TCL will be compared with high end vendors like Apple as to FRAND rates, giving low end vendors the benefit of favorable rate packages that high end vendors have been able to negotiate with respect to far more expensive products. Competitive Harm. Ericsson argued that in order for an instance of discrimination to violate Ericsson’s FRAND commitment, it must have the effect of “impairing the development of standards” (p. 91). A similar systemic approach was taken in Unwired Planet, in which the UK court held that a violation of FRAND would not arise unless discriminatory treatment of licensees would “distort competition” (¶501). Judge Selna in TCL v. Ericsson takes a different view, holding instead that discrimination in violation of a FRAND commitment can be found so long as an individual firm is harmed. He expressly rejects the application of an antitrust-based standard, which requires harm to competition rather than harm to a competitor, to the analysis of a FRAND commitment (p. 91). Comparison to Ericsson’s Offers. Though the options offered by Ericsson were complex and involved both lump sum payments and royalty floors within certain ranges (making them difficult to compare to other licenses), the court estimated that under one option, Ericsson’s offer to TCL translated to a running royalty on handsets of approximately 1% for 2G, 3G and 4G, and under another option 0.8% – 1.0% for 2G, 1.2% for 3G and 1.5% for 4G with a $2.00 per unit floor and a $4.50 per unit cap (p. 90). The royalty floor proposed by Ericsson was apparently intended to address TCL’s low selling price for handsets, so that Ericsson would receive an assured royalty stream no matter how cheaply TCL priced its handsets. Slightly different royalty schedules were proposed for external modems (p.90). Discrimination. Based on this analysis, the court holds that Ericsson’s offers to TCL “are radically divergent from the rates which Ericsson agreed to accept from licensees similarly situated to TCL” and that Ericsson’s offers to TCL were therefore discriminatory and noncompliant with its FRAND obligations (p. 94). In particular, the court holds that Ericsson’s proposed “floor” on royalties payable by TCL was discriminatory (p. 113). This being said, the court also finds that Ericsson negotiated in good faith and that its conduct during the negotiations did not violate its FRAND obligations (p. 3). Royalty Base and SSPPU? It is notable that the court’s decision in TCL v. Ericsson does not discuss the often contentious issue of the appropriate royalty “base” for TCL’s products – the figure against which the percentage royalty is applied. As explained in cases such as Ericsson v. D-Link, parties often disagree whether the SEP holder’s royalty should be applied against a component (e.g., a chip) embodying the standardized technology or against an end user product such as a smart phone. If the percentage royalty rate is not adjusted, the choice of the royalty base could result in radically different payments to the SEP holder. This concern has led to debates over the appropriateness of using constructs such as the “smallest salable patent practicing unit” (SSPPU) as the royalty base. I understand that this debate was largely avoided in this case because TCL conceded that the royalty would be charged against the selling price of its handset units. On the basis of these findings, the court prescribes that the parties enter into a 5-year license agreement reflecting the FRAND rates described above (p. 115). In addition, TCL must pay Ericsson approximately $16.5 million for past unlicensed sales. While the outcome of this case will likely make it easier for firms such as TCL to compete in the U.S. and other major markets, it also establishes several important guideposts for future FRAND license negotiations. First, the case establishes that, for non-discrimination purposes, even low end vendors like TCL will be considered “similarly situated” to high end vendors like Apple, giving them the benefit of the rates that high end vendors negotiate with SEP holders for much more expensive products. Equally importantly, it highlights the growing predominance of top-down royalty calculation methodologies for FRAND licenses. wow – this was an education. I don’t know nearly enough economics to go into this area. One question what is the reason for lumping low end firms for TLC with firms like Apple – it would seem obvious that TLC is not a similarly situated firm for TLC. If I know the price for the final product my percentage is calculated against is going to be high – I will be more willing to accept a lower percentage. Given that we know now that many professors are given money to write articles to an abstract, I think all professors should disclose what money they have taken from corporations and under what conditions. The presumption should be that the professor has been paid to take a position by a large corporation and is trying to pretend it is scholarship. Night, did any IP professor not participate in Oil States? Dennis perhaps? I’d bet dollars to doughnuts that Prof. Duffy took money for his position about the “new prior art reference,” and to my knowledge did not disclose the money he took. The opinion is an incoherent mish-mash of French law (mentioned in passing, at best), dubious economics, and what appears to be federal common law. It seems obvious questions were missed, such as: (1) did the judge satisfy the eBay requirements for using its powers in equity to force Ericsson to give TCL a license under these terms? and (2) does French law even provide for involuntary licensing as a form of equitable relief for a breach of contract claim? In any event, the only thing clear about this opinion is that no patent owner in its right mind would ever agree to ETSI’s terms. If you’re going to have ideal notions of FRAND obligations, there needs to be at a minimum a duty to license or penalties for failing to license. Or the ETSI policy should make clear that the FRAND obligations cease to apply if an alleged infringer chooses to litigate noninfringement and invalidity defenses. Penalizing (in any form) the choice to litigate invalidity would not survive as being against public policy. That being said, this is a veritable juggernaut of combined and conflated issues (to which, a seemingly endless supply of potshots could be taken). Most SSOs don’t analyze essentiality on their own so penalizing someone for arguing noninfringement (i.e., that it’s not essential) would be a problem. ETSI, for instance, doesn’t do any analysis of essentiality. Charles, the suit seems in the nature of the equitable remedy of specific performance of a contract obligation. It is not simply a breach of contract because that only covers past damages. Note that if the FRAND royalty amount dispute is a breach of contract suit rather than an infringement suit it can end up on appeal in the regional circuit court, not the Fed. Cir., per the Fed. Cir., as it did in Microsoft v. Motorola (9th Cir. 2014). The 9th Cir. did look to some Fed. Cir. case law, but it did not have to. P.S. “$100 per patent” [20 minutes or less of patent attorney time] to determine if any of the claims of that patent cover any required part or feature of the subject standard?? Should say “don’t KNOW enough”.